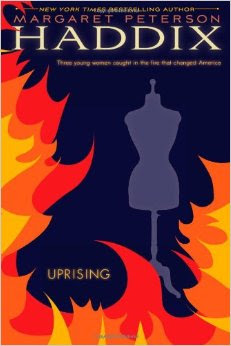 The Triangle ShirtWaist Factory strike and subsequent fire of 1911 is told through the perspective of three close friends: Bella, who has immigrated from Italy to send money back to her family, Yetta, a Russian immigrant who dreams of becoming a revolutionary, and Jane, who has rejected her father's wealth as criminal after being active in the strike. They choose each other as their comari, friends who are closer than family. The perspectives alternate between the three and all of them are strong characters. Bella and Jane both start off as very ignorant and naἲve. Both learn to be strong and independent. Yetta is more savvy the entire time, but she too goes through the struggle of realizing her dreams are distinct from reality. After I read it, I felt restless and dissatisfied with my life. I should have felt grateful that I get so much time to do with what I chose. These girls were vibrant and alive, despite being shut up in a factory for much of the time. Instead, I felt like my life is small and that I'm not doing enough to alleviate the suffering in the world. "How could you want to have a normal life in a world where people set other people on fire?" Yetta murmured. "In a world where policemen beat up shirtwaist girls?" How can that not make you want to change the world?" Despite the seemingly negative response to the book, it was simply a sign of how powerful a portrayal it was. I was soon galvanized into action. I loved how the author incorporated the 'Bread and Roses' theme. The girls were scraping together enough money for rent and food. When the other girls complained of their plain lives, Bella went to 5th Avenue and bought a single rose. The girls spent the rest of the night gazing at the rose. Reading this book helped me to understand Haddix's tendency to write subversive themes in more standard fairy tales such as Cinderella. I highly recommend it to anyone who would like to know about women's and labor's struggles. Bread and Roses, Too by Katherine Patterson is also a great book on this topic.